This new groundbreaking two-volume book by Rabbi Tovia Singer clearly and definitively dismantles long-standing Christian charges against the Jewish faith. Having devoted more than 30 years of his life to responding to missionaries who target Jews for conversion, Rabbi Singer is widely regarded as the leading scholar on Jewish evangelism. This latest work is encyclopedic in scope, and lucidly illustrates why Judaism does not accept the Christian messiah! 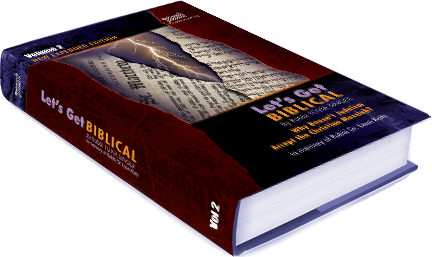 This comprehensive new two-volume work, Let’s Get Biblical! Why Doesn’t Judaism Accept the Christian Messiah? Volume 1, takes the reader on an eye-opening journey through timeless passages in Tanach, and answers a pressing question: Why does Jewish faith dismiss the Christian claim that Jesus is the fulfillment of prophecies outlined in the Hebrew Bible? 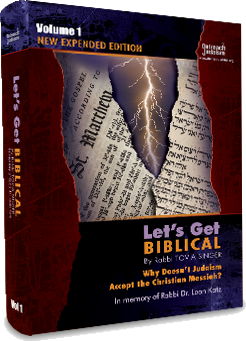 In this fascinating volume, Rabbi Singer reveals why the teachings and theological claims advanced in the New Testament are utterly incompatible with and opposed by the enduring prophecies in the Jewish Scriptures. Moreover, this eye-opening book demonstrates that the many inconsistencies strewn throughout the Christian Bible cannot be attributed to the careless errors and profound ignorance of the authors of the New Testament. Rather, Singer demonstrates with unassailable clarity that the Church systematically and deliberately altered the Jewish Scriptures in order to persuade potential converts that Jesus is the promised Jewish messiah. To accomplish this feat, Singer carefully illustrates that the writers of the gospels and other canonical books of the Church, as well as later Christian ‘translators’ manipulated, misquoted, mistranslated, and even fabricated passages in the Hebrew Scriptures in order to make its verses appear to be speaking about Jesus. This exhaustive and eye-opening book probes and illuminates this thought-provoking subject. Tragically, over the past two millennia, the Church’s faithful have been completely oblivious to this Bible-tampering because virtually no Christian can read or understand the Hebrew Scriptures in its original language. Since time immemorial, earnest parishioners blindly and utterly depended upon manmade Christian ‘translations’ of the ‘Old Testament’ in order to understand the ‘Word of God.’ Understandably, churchgoers are deeply puzzled by the Jewish rejection of their religion’s claims. They wonder aloud why Jewish people, who are reared since childhood in the Holy Tongue, and are the bearers and protectors of the sacred Oracles of God, do not accept Jesus as their messiah. How can such an extraordinary people dismiss such an extraordinary claim? Are they just plain stubborn? Let’s Get Biblical! thoroughly answers these perennial questions.